The Samsung C32HG70 offers superb colors and contrast combined with a QHD resolution and a 144Hz refresh rate for an eye-popping gaming experience. The Quantum Dot equipped VA panel is responsible for this model’s extensive gamut coverage, allowing it to have a certain level of support for HDR visuals. The Samsung C32HG70 and its modernized features symbolize the brand’s refocused endeavor to reach out to gamers, and by the looks of things, it shouldn’t disappoint. 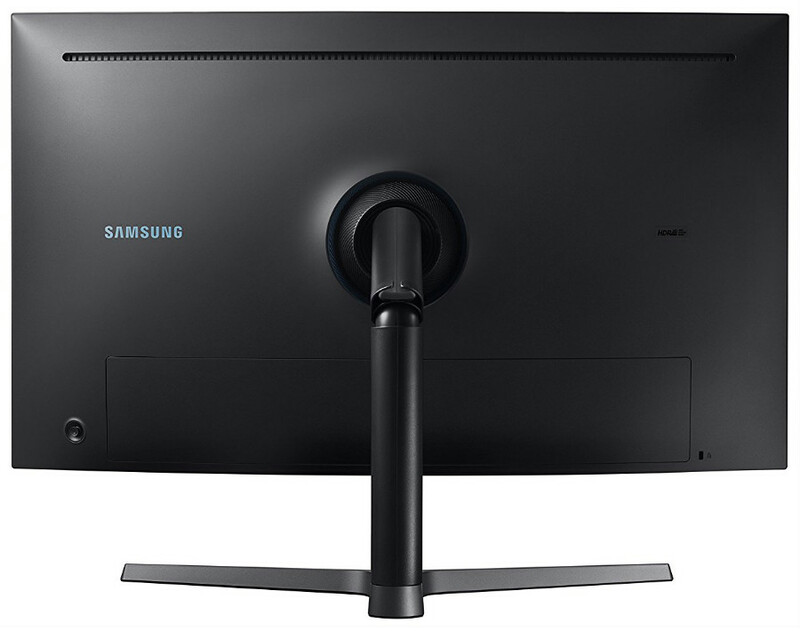 The Samsung C32HG70 could easily be mistaken as an office or studio monitor thanks to its simplistic design. The cabinet comes in matte black with thin, 12mm bezels which are free from unwanted accents or designs save for the discrete Samsung logo on the bottom strip. The sides have a plastic trim with an aluminum-like finish which adds a bit of flair to a vanilla-looking display. The product’s proportions are within reasonable limits, although the slightly thicker appearance from the sides is because of the curve’s profile. This model has a slightly pronounced bulge when compared to its 27-inch version due to the internal power brick included in the innards. The whole devices weigh in at a hefty 21lbs, but we did not notice any jerking from the cabinet since it stood steady. The rear of the cabinet is clean and simplified as well thanks to its smooth, matte black finish and a discrete brand logo on the left. Only the distinct multi-direction joystick similar to the ones on the CFG70 series are readily visible since the I/O is covered with a plastic panel for neatness. With this model, you get a DisplayPort 1.4, two HDMI 2.0 slots, and three USB 3.0 receptacles. There are no integrated speakers, but you can use the 3.5mm jack for audio pass-through for headphones or desktop speakers. One of the USB slots can be used to quickly update the firmware of the Samsung C32HG70 for performance increases. We recommend users to upgrade this monitor since essential changes such as extended FreeSync ranges are included in the hotfixes. 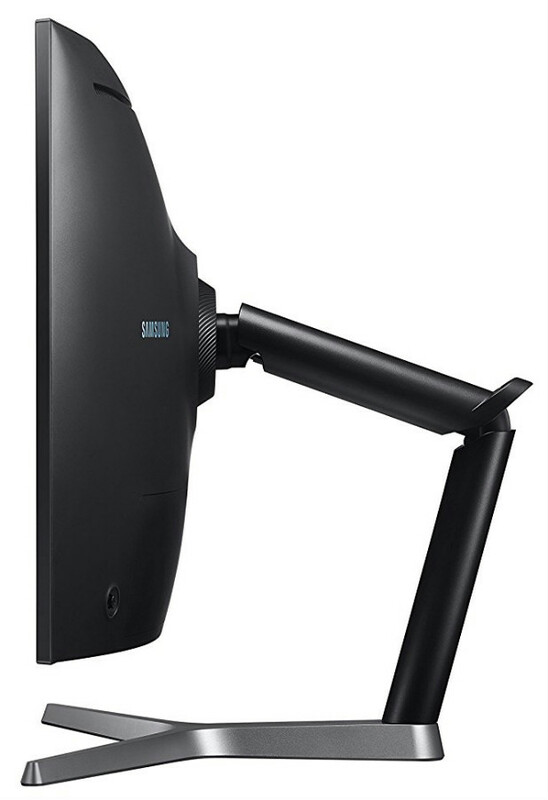 The Samsung C32HG70 comes with a uniquely designed stand similar to an articulating arm which is pre-assembled from the factory. The mechanism is fully removable for mounting, although you will need to utilize the included bracket for VESA mounting. The armature offers a decent range of ergonomics which include height, tilt, swivel, and pivot, so a comfortable view angle is achievable. One hidden feature on the Samsung C32HG70 is the lighting feature which is hidden just behind the stand attachment. This LED ring glows blue gently although you can remove the plastic shroud to increase its brightness so it can add a bias lighting effect to your screen. Our only complaint here is that the stand eats up a lot of space on your desk, so it might be impossible to push the screen away from you if your table is shallow. The Samsung C32HG70 features a 31.5-Inch curved VA panel with a 2560 x 1440 resolution, 144Hz refresh rate, 4ms response time, and a generous 3000:1 contrast ratio. The screen has a 1800r curvature which feels just about right at this size, creating the impression of envelopment that makes games a bit more engrossing. Curved displays are one of Samsung’s specialties, so it isn’t surprising that there was no image distortion on the corners that was noticeable during the test. What sets this model apart from its competitors is the addition of a Quantum Dot film which helps to enhance the vibrancy of the screen. As measured, sRGB coverage reaches 127% while DCI-P3 sits at 94%, bringing the color reproduction close to the requirements of HDR10 standards. Accuracy is spot on as well since the Samsung C32HG70 only has a maximum Delta E of 1.2 for lifelike colors. By default, the Samsung C32HG70’s contrast ratio sits at 2100:1 which is already excellent by itself, but adjusting brightness can improve this to around 2300:1. Other models that use VA panels sometimes struggle to go past 2000:1, so this aspect is a huge plus for this device. What perplexes us, however, is Samsung’s use of PWM dimming, which by today’s standards is backward and unsuitable for the visually sensitive. The Samsung C32HG70 claims to have a 1ms Motion Picture Response Time which is slightly different to the usual G2G times we read on spec sheets. This model includes the option to boost this aspect of the monitor with three settings using a strobing backlight for the Faster and Fastest modes. Using the maximum level did not produce overshoot and it cured the interlacing up to a certain degree, but there were still some instances wherein some trailing was noticeable. But in doing so, be aware that using the Fastest response time mode will drop your maximum brightness to 210cd/m2 which can be good or bad for different situations. For us, sacrificing luminance and gaining a cleaner, and blur-free performance from the Samsung C32HG70 is a worthy exchange. The improvements in pixel transition are drastic, and we can say that this model is one of the implementations of a VA monitor that usually comes with pixel transition issues. The Samsung C32HG70 promises HDR compatibility right out of the box which it achieves via its full gamut coverage and eight edge-lit local dimming zones on the screen. Accuracy and effectiveness aren’t similar to a FALD backlight found on the Dell UP2718Q, and there was some backlight bloom which was noticeable. To use this feature, you only have to provide an HDR signal to the monitor, and it instantly reacts by activating relevant features and showing an HDR logo on the lower corner. The most significant issue with HDR usage on the Samsung C32HG70 lies more on the limited content availability and OS compatibility. In some circumstances, the screen became washed out or undersaturated when a title’s HDR function or your OS isn’t fully compatible. It’s a hit or miss, although we think this device is a worthy investment if you want to test the waters in HDR. However, if you do meet the necessary hardware and software requirements or if you are using an HDR-ready console like the PS4 Pro, the improvements are there. The deepened contrast and color representation become easily noticeable, providing a satisfying peek into the capabilities of the technology. If the screen weren’t hounded by light blooms or halo effects, we would recommend the Samsung C32HG70 as a dedicated HDR monitor. The Samsung C32HG70 carries Standard and Ultimate FreeSync modes with varying functional ranges for tear-free performance. The former is a laid back implementation designed as a fallback in case you experience artifacts or issues at the Ultimate Setting. And while having two options and seamless visuals is an excellent addition, using FreeSync will disable the backlight strobing and reintroduce ghosting issues. We recommend users to test out different mixes of settings to suit each personal taste since the Samsung C32HG70 is excellent either way. Input lag sits a bit high at 25ms by default, but there is a Low Input Lag mode that you can activate to improve this score. Once turned on, latency instantly drops to 6ms, bringing the Samsung C32HG70 into E-Sports territory regarding responsiveness. The Samsung C32HG70 is, by all means, an excellent gaming monitor that offers several pioneering technological advancements in one product. Each implementation of these has a beneficial effect on the monitor’s performance, expanding the options each user can use to improve visual experiences. The product’s HDR application is reasonable and superb if you get it to work correctly and have compatible titles or media that is compatible. However, this model doesn’t come out unscathed or without issues such as the blurring and ghosting flaws if strobing is disengaged. 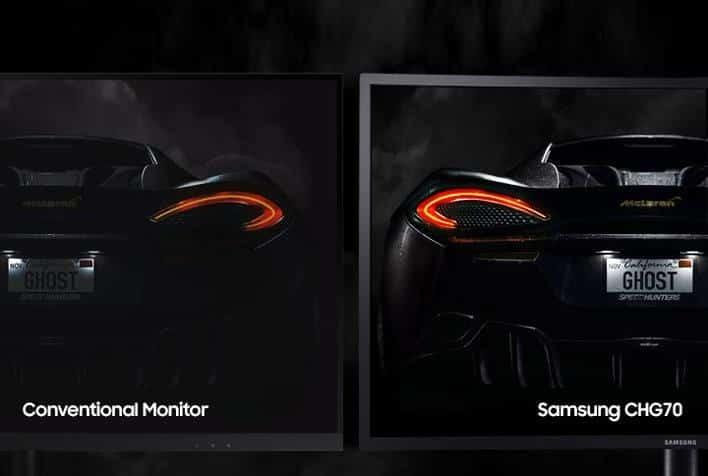 Samsung is taking the correct steps in advancing their gaming monitors, and we would like to see them improve in these aspects. Overall, the Samsung C32HG70 is a worthy investment if you want a brilliant gaming monitor and a taste of HDR, although be warned that these goodies come at a fairly premium price. I am planning on buying this monitor but I own an Nvidia GPU. Is HDR only working on AMD cards? I could not find a clear answer to this in the internet. Does QLED do it a better option from LG 32GK850G? Which one will look better for gaming AND movie? Hi, Carles! HDR will work with Nvidia GPUs as well. The Samsung C32HG70 is great for both games and movies, but the LG 32GK850G’s significant advantage is its G-Sync compatibility. Choose wisely! Thank you for your valuable inputs, Odd Helsing! Are you sure it has a 4ms response time? All the websites selling it say that it’s a 1ms response time. I’m considering buying this monitor and if it is 4ms that would be a deal breaker for me. Hello, David. the 1MS MPRT is a claimed spec and should be taken with a grain of salt. We listed 4ms because typically, all VA panels have 4ms response times (which also should be taken lightly). 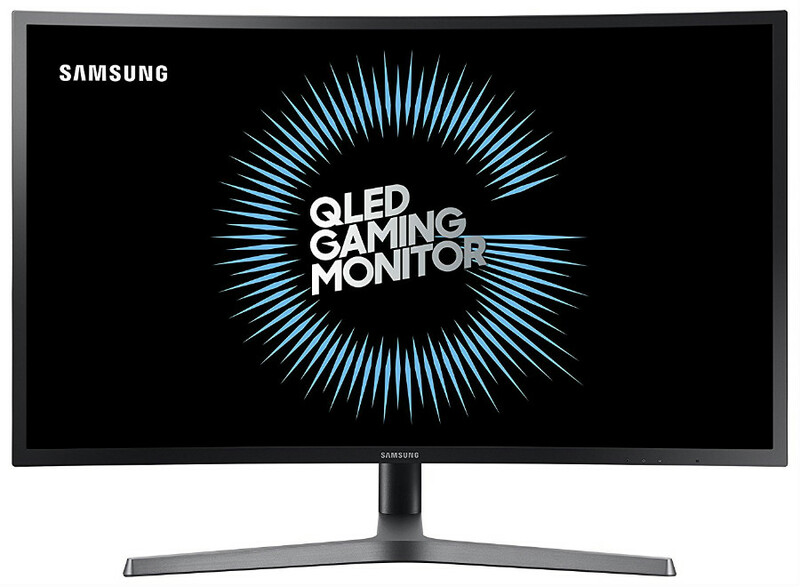 If you are serious about considering a monitor and its response time which refers to gray to gray pixel transition, the Samsung C32HG70’s average result is 13ms GtG. Do not worry, however, since this score is within a decent range, and shouldn’t affect your usage. Overall I have an excellent impression. The size is what I wanted and expected. Pixels are not visible if you don’t put nose to your screen. I like the IQ, responsiveness and viewing angles.